I’m too old to remember my first repeat customer, but I’m not so old that I can’t remember how powerful it was to have customers who’d come back and buy from me again, and again. Like most people with a sales background I was basically lazy. Repeat business fueled my inner passion to not work any harder than necessary. The effort exerted to persuade somebody to buy from me once, was at least twice (maybe three times) harder than it was to repeat that process. 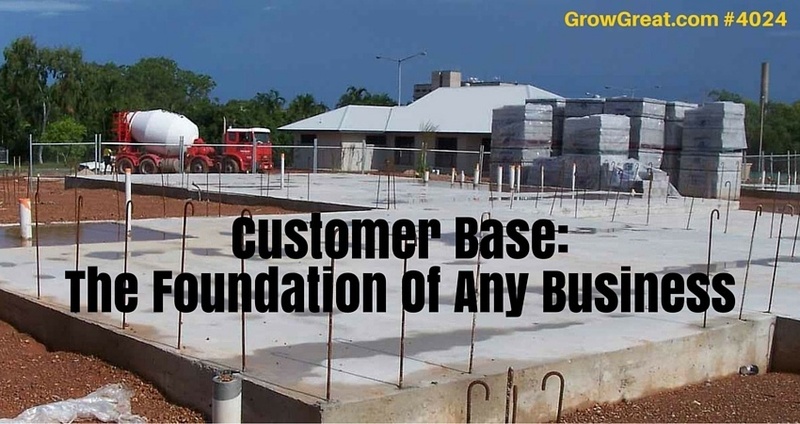 Enter the power of building a solid customer base! How can more business owners fail to understand the power of it? That’s easy. We need sales today. That whole “what have you done for me today” mindset has set up harder than the concrete foundation that serves to illustrate today’s episode. Too often we concentrate on making the cash register ring today (okay, I know we don’t all have cash registers, but it’s still the metaphor for getting customers…or actually, for making a sale). I was still a teenager when I learned that businesses can chase all sorts of things, but chasing cash is the worst one of all. Customers, inventory, employees — we have to chase many things and succeed in catching them. But nothing is worse than chasing cash. It fuels a desperation that every business person has experienced at some point in their life. Short-term thinking sparks us to concentrate on getting customers today. Sometimes it compels us to be too transaction oriented, losing sight of the value we need to provide to our prospective buyers. As we focus on making the register ring today we can neglect to pay close enough attention to the clients who are running from us out the back door. Intently focused on the front door, we just care about getting new bodies in so we can make our cash flow dreams come true. Problem: it’s a never-ending story! Like the worse drug addiction, business owners grow addicted to new customers. Ask ten business owners about their existing customer list, “When you did last reach out to them?” — and quite often the response is, “Oh, I don’t know. It’s been a little while.” Probe a bit more and ask them to provide you a print out of their best customers and you’ll quickly see how little they focus on people who have purchased from them in the past. I know because I do it with some regularity and the responses are almost always the same. “I’m sure I could get that for you,” is the most common refrain I get when I ask an owner if they have a list of their best clients. Those same owners can much more easily tell you what yesterday’s sales were, or even what today’s sales are so far. All eyes are on the front door! Pour a slab, a foundation. What’s next? Frame it up. Finish it out. At some point we’ve got windows and doors. Doors give us entry to the building. And exit. Yet we can more easily focus on getting new customers – the entry – and not focus much at all on serving existing customers BETTER – so we can prevent customers from leaving us! Have you ever watched an episode of Gold Rush, that Discovery Channel show about gold miners up in Alaska? One of the worst things that can happen to a gold mining operation is for the sluice box (the contraption that is designed to catch the gold) to malfunction and let gold pass through. It’s money going down the drain (or out in the wash). That’s what happens when we don’t pay attention to existing customers! Focus on loading more payload into the front end of the process — like gold miners who make sure they’ve got enough dirt to wash — and you may soon discover there’s no gold coming out the other end. No customers. No customer base. A critical component of building a great business is developing systems that will effectively bring in new customers while simultaneously continue to dazzle the existing customers. Great businesses know how to do both at the same time. So why don’t more businesses focus on both of these? Why do some take their eyes off of customers as soon as payment is received, or services/goods are rendered? Because they don’t know the true lifetime value of a customer. Because they’ve developed a system for attracting/getting new customers, but they’ve not developed one for hanging onto existing customers. Because they think new customers are more valuable than existing ones. There are likely many other reasons. None of them make any sense though because they all erode the customer base. It’s a common plight of businesses that are too focused on transactions, not customers. It’s the siren call of the cash register. We get lured by the quest for new money. Meanwhile, the old money is walking or running out the back door taking their business to a competitor. What’s The Value Of Existing Customers? A: They already said YES to us. You forgot that. All that hard work you put into attracting potential customers, and all the effort spent showing prospects why you are the ideal solution…that’s already been done with existing clients. They already experienced it and found you were worth the investment. You don’t have to go back to square one and try to attract them. It’s ground you already plowed, planted, fertilized and watered. You’ve likely neglected it so it’s going to require some effort to get the soil in good shape again, but that’s doable. Tend your garden. B: They have feedback that will help us improve and grow. Because existing customers have been through the process with us, they have a unique perspective. We can tap them for insights into ways we can do better. Refusing to have meaningful conversations with them is a lost and wasted resource that might make all the difference in the world in us experiencing growth or failing to grow. All because we simply didn’t ask the questions that could have helped us. Find out from your existing customers what the experience felt like. Ask them why they bought from you. Ask them what went well…and what didn’t. Too often we’re nervous to have conversations with existing clients because we’re fearful they’ll aim a double-barrel shotgun at us and blast away with complaints and issues. Don’t fear that. Embrace it. Be hopeful you’ll get a few of those blasts because it’ll mean you can fix the problem. C: The dissatisfied and unhappy existing clients can often become our most loyal advocates. An existing customer with a problem is one of the biggest opportunities we’ve got. See it for what it is. Don’t shy away from it. Lean into it. This may be the first you’re hearing of it (likely if you’re not in the habit of checking in on existing customers regularly). Then, gather the facts, ask permission to look into this to see what you can do to fix it, then agree on a time when you’ll get back with them. Keep your word at every step. You’re trying to fix a problem and create the most loyal advocates you’ll ever have for your business. That’s because this client will have seen how you respond to problems. Most customers don’t see or experience that. It’s powerful so don’t neglect to use it fully. A customer who is unhappy and willing to tell you about it can be turned into an advocate if you’ll handle it well. For starters, don’t get defensive. Acknowledge their pain and disappointment. Next, apologize. Be genuinely apologetic about their experience. Don’t humor them. Don’t scold them. Don’t blame them. Accept full responsibility. Then, assure them you’re going to fix it (but ONLY if you really intend to). Too often this is where I see businesses fail. They do pretty well up to this point, then implode by making a bad situation worse. They promise to fix it, then fail. Better to not promise, than to promise and not deliver! Be careful. Ask the client what you need to do to make them happy. Failure to do this is equal to being offended by somebody only to have that person tell you exactly what they’re going to do to remedy the offense. No, YOU were offended. The terms of reconciliation are squarely on your shoulders, not theirs. But when it comes to customers we want to decide what we’re going to do to make them happy. All without ever asking them, “Mr. Customer, what would it take for me to make you thrilled?” Ask. If you can remedy it on the spot, do it. Don’t delay. Business owners and other top leaders have the power to hit the Happiness Button for the customer immediately. Do it. Think as they’re telling you what they’d like — about how you’ll executive it, about how much it may cost (and I don’t mean in full profit costs, but in real hard raw costs to you) and make a decision. I’m not a fan of negotiating this, except in extreme circumstances where sometimes (rarely in my experience) I encounter an existing customer who is completely unreasonable. In over 40 years of running businesses I can count on one hand the number times that’s happened though. It’s rare. Most people are very reasonable and more often than not I encounter a proposal that is less than what I would have done otherwise. Go above and beyond if you can. After the client tells you what you can do to recover, think seriously (and quickly) about dazzling them. It’s analogous to what Bible students often call “second mile religion” taken from Matthew 5:41, “And whosoever shall compel thee to go one mile, go with him two.” That’s where get that phrase, “going the extra mile.” Do that with your existing customer who is disappointed. If you’re able to exceed their request, do it. Don’t overthink it. Don’t over calculate it. Remember, this person is going to tell everybody they know. And in the day of social media, that might mean many more people than you think. You can’t view this in isolation. This isn’t just a single client we’re talking about. It’s your company and what your company represents. It’s reputation. Handle it with great care. D: Existing customers want to buy more. Most people put this up front. I put it last because it’s important, but it fosters too much self-serving behavior. I’d encourage you to focus on how you’re robbing existing customers of more services, products or whatever it is you DO. By neglecting them you’re not serving them well. Worse yet, you may be forcing them to search elsewhere to remedy a problem you could more easily fix for them. You’re an existing and known supplier. That gives you a cost advantage even if your prices are slightly higher — a time cost advantage. Your customer doesn’t have to get to know you, or trust you. They don’t have to go through the vetting process, or the trust building process. That’s worth money to them. You owe it to them to be there when they need you without forcing them to chase you down. It’s your job to be on the forefront of knowing their needs as they happen in real-time. That means you have to drive the bus in this relationship. Take charge. Be of service. The bigger the building, the stronger the foundation required. The same is true with our businesses. You can pitch a tent anywhere. It’s not a sustainable structure. We’ve got too many businesses being run by tentmakers. Anybody can make one sale, or 100. Can you keep making sales? Can you make people happy. Consistently, over time. Sustainable is the minimum bar you must jump. You’ve been doing that. That means you continue to find new customers willing to let you serve them. That’s excellent, but that’s not providing a solid customer base, or foundation. Strengthen your foundation for quantum leap growth by making sure you’re dazzling customers over and over again. Start judging yourself more strictly on how many people agree to do business with you a second, third or fourth time. Close that back door and stop letting customers leave you to find a solution elsewhere. That’s how you’ll grow your business! I know it’s not complex, sophisticated or filled with buzzwords that prove how smart we can be. That’s because business building isn’t effective with all that stuff. The guys who pour the slab have to get a few fundamental things just right. It’s not complex, sophisticated or filled with buzzwords. It’s doing the right thing the right way. Period. Go to work!